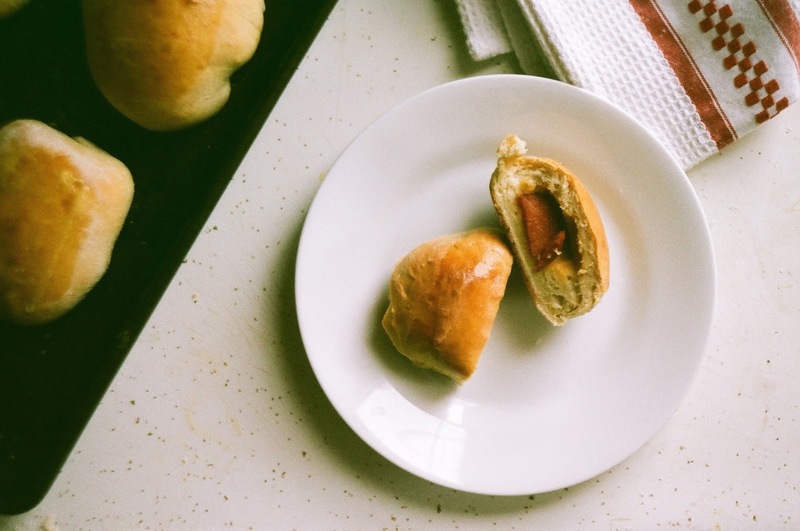 When I was moving from D.C. to West Virginia, I told people I was trading in my half-smokes for pepperoni rolls, both being the iconic cheap convenience foods of the respective places. 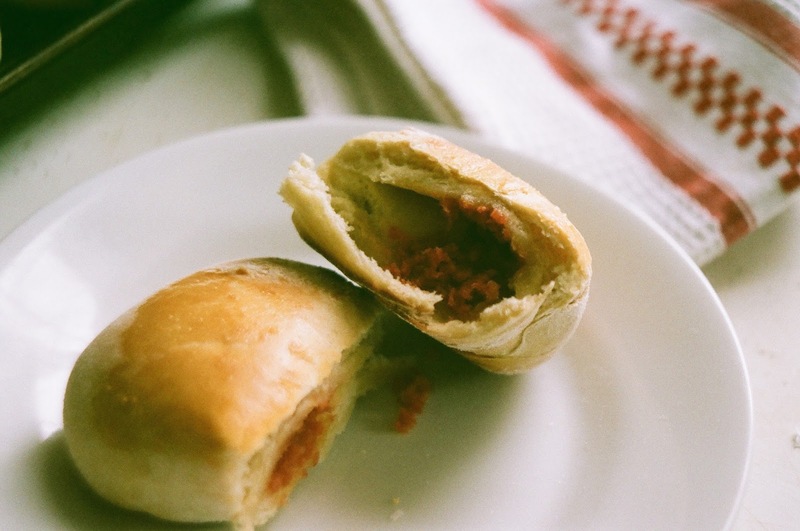 Though pepperoni rolls are most prevalent in the Western part of West Virginia, where there's a concentration of residents with Italian heritage, the stuffed rolls are now found throughout the state. 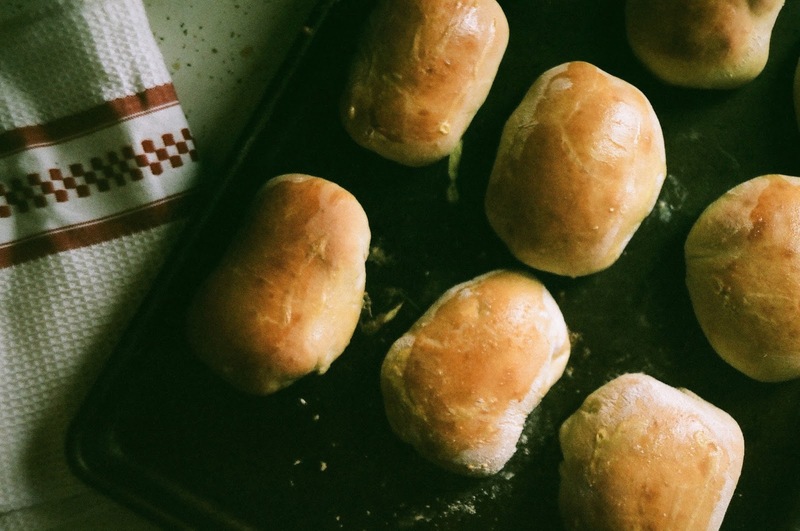 Fairmont baker and former miner Giuseppe "Joseph" Argiro, originally from Calabria, Italy, is credited with creating the first pepperoni roll in 1927. He had observed his fellow miners eating pepperoni with bread while at work, and decided to combine the two into a easily portable pocket food (miners have a history of inspiring delicious pocket foods--if you've ever had a Michigan pasty, you know what I'm talking about). Argiro founded the Country Club Bakery where he sold the rolls, and eventually passed the business on to his son Frank "Cheech" Argiro. It's still in operation today. The classic pepperoni roll uses pepperoni slices or sticks, rolled in white bread dough (not pizza dough, like stromboli), and does not include cheese. Though perceived as sacrilegious by some, variations can employ shredded pepperoni, cheese, peppers, and even chili. In my opinion, a good pepperoni roll needs no extra flavor or moisture, as the oil of the pepperoni roll is absorbed by the bread, creating that telltale orange hue along the edges. That key pepperoni roll truth is deemed unappetizing to some (like my boss), but delicious to many (like me). Of course upon establishing myself in the Mountain State, I knew I needed to try my hand at the things, and I found this recipe from Kendra Bailey Morris via American Food Roots. I made them during the blizzard last month, and they weathered us all the way through the storm. 1. In a small bowl, combine yeast, warm water, and ½ teaspoon sugar until yeast dissolves. Let stand at room temperature for 45 minutes until foamy. 2. Meanwhile, place potatoes in a pot with at least three cups of water (enough to make approximately 2 ½ cups leftover potato water) and cook until tender. 3. In a blender, pulse cooked potatoes and 2 1/2 cups potato water in a blender. Add the ½ cup sugar, butter, and salt, blending well. Add the egg and blend 5 seconds more. Let mixture cool to lukewarm. 5. When you're ready to bake, preheat the oven to 400 degrees F. Turn dough onto a floured board and cut into quarters. Continue to cut into roughly 40 small pieces. 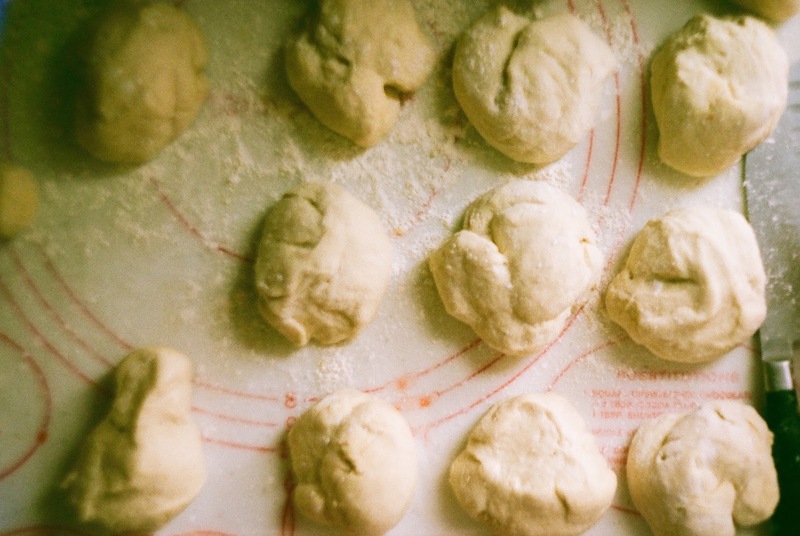 Take a piece of the dough and push it flat into a rectangle. 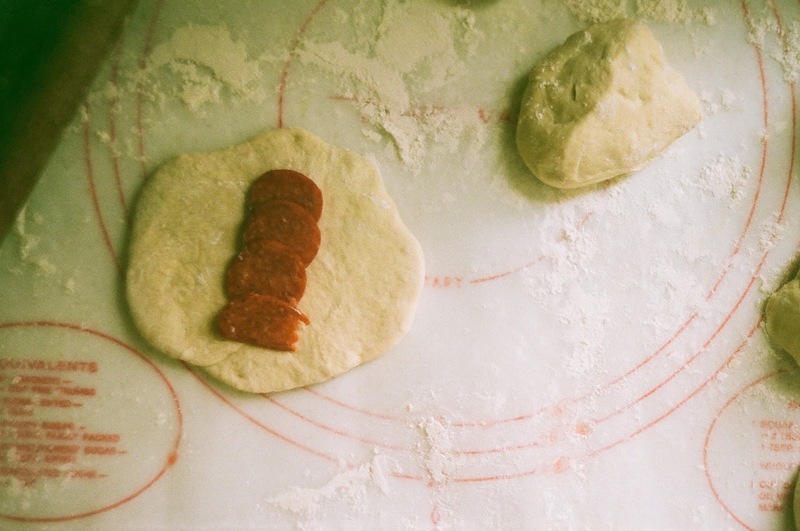 Place 2-3 slices of pepperoni in the middle (overlapping and not stacking) and roll, pinching the ends of the dough to hold the pepperoni inside. Place on an ungreased baking sheet. Repeat until you’ve used up all of your dough and pepperoni. 6. In a small saucepan, melt the butter and sugar. Remove from the heat and let cool slightly. Add your egg and mix well. Brush tops of the rolls with this mixture, then bake them until golden brown, about 12 to 15 minutes. Your story about the Argiros is the one my maternal grandmother Catarina Peluso Sansalone told me. My grandfathers were coal miners and my maternal family was from Calabria as a large % of Italians in Fairmont/Clarksburg area were. As you know, I'm from Fairmont and Country Club pepperoni rolls were the ones we chose when my grandmother who lived with us from the time I was 5, wasn't making them. But make them she did--usually every week when she made homemade bread. Yes, she used the bread dough, used oblong sticks of pepperoni, and made the rolls oblong as well. She often made bread for the Catholic Daughters bake sales and her bread sold out first because it was the best there. I am a baker but I don't make pepperoni rolls because pepperoni is actually a poor product so unlike the fantastic salsiccia in Calabria that can't be exported. Olli makes a good product without preservatives that could be a good substitute.